So I have been here a few weeks now and we have got lots of jobs done. One of the biggest reasons for so many jobs is that Kim and Simon on Britican have decided to invite people onboard so they need the boat to be coded by the RYA to take 12 paying passengers onboard. They will only take 8 people as the boat, even though she a big boat at 56ft it does not have the space for so many people at once, so 8 is more than enough. I was only here one day when the man came to inspect the boat and since I have had my boats coded like this at home, it was really straight forward. After about 4 hours inspecting the boat he was very happy and only had a few things he wanted us to do which was done straight away, photographed and sent over to him. Simon was also waiting a few other things to arrive and when they did we would be ready to go. After everything was sorted Kim and Simon wanted to get me sailing but the first sail was just a few hours away which was fine by me as we needed to sign out of the country, get some groceries, and we also gabbed some fuel too. After all those jobs were done we were off again and this time it was to a place called Sandy Island which was about 5 hours further north. It was a lovely sail and we arrived at a beautiful destination, grabbed a mooring ball (fixed anchor) and relaxed. Well we did not relax for long as I went into my bedroom and it was very smelly and we found water on the shelf. I proceeded to take the wall down, which is just velcro, and we found the problem straight away. One of the bolts were leaking and as we hit thee waves it was coming in. It was nothing to worry about but it still needed to be fixed. Simon came in to help and while I was filming the expressions on his face were so funny I started to film him instead. The second I started to take the micky out of Simon, Kim took a turn for the worst. Her heart was going even faster then before and started to lose the feeling in her arms and legs. All of a sudden it had gone a bit Pete Tong so Simon called for a ambulance to come, but the only problem with that was that we were on the boat. The ambulance arrived and off she went to the hospital… There was not a lot I could do now so, myself and Sienna went back to the boat where we waited for a call from Simon to let us know what’s happening. 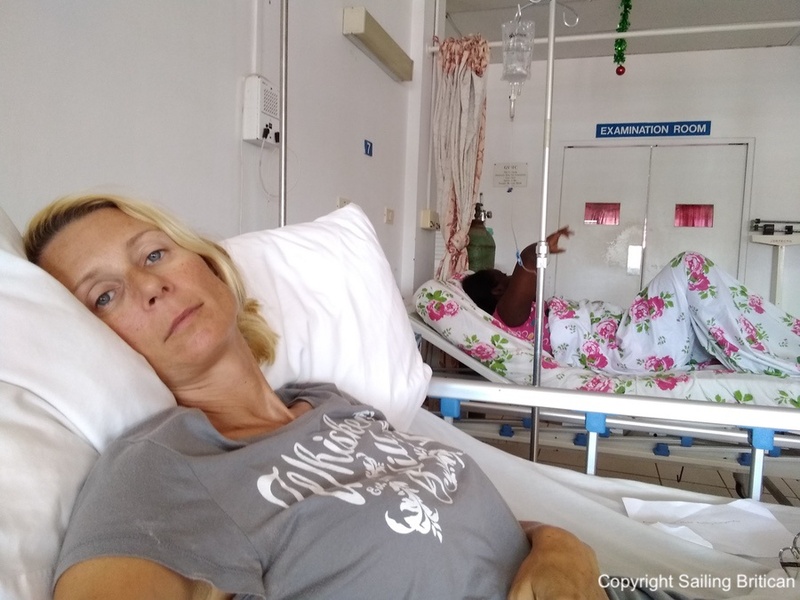 Within half an hour we got a call saying that they were going to fly to Grenada as this hospital does not have the means to look after her, so could I bring some clothes, mobiles, chargers and anything else we could think off and meet us at the airport. Myself and Sienna gathered everything together, jumped back into the dingy and sped off to the beach. When we arrived Simon called again to say that he was waiting for confirmation of the flight down the Grenada so could we wait at the beach until everything was good to go. After a little wait we got the go ahead to be a the airport which was only minutes away. Once we started to walk to the airport we were given the wrong directions and told to go the other way. We quickly turned and went the right way, when we heard to siren from the ambulance, so we started to run. When we got closer the gate was open and we just entered but it was not until we saw the runway that we realised it was the wrong way. Stuff it said to Sienna, we are here now, but then all of a sudden the plane landed, so we ran across the runway to where Kim and Simon we waiting. Yes, I know what you are thinking, but I was thinking about Kim, as I could not let her go without a change of knickers. Ha Ha. After that, I got a real dressing down by some lady but it was done now and there was nothingshe could do about it. Well there was, but in this situation I think she just let me off with a dirty look. As I turned around I saw Kim lying in the ambulance looking at me spaced out so I gave her a kiss on the forehead and Simon a cuddle and I just blurted out that I would see them in Grenada. What was I thinking, I have never sailed on my own before and with a little girl too. Surely it must be me that needed to go to hospital for saying such a stupid thing, but to my amazement Simon said that would be great thank you. To be honest I don’t think anyone was thinking, but we just got on with it. Once we arrived back at the boat, I sat Sienna down to explain what we were going to do tomorrow and that was sail on our own back to Grenada. I also told a little white lie and said that her Mam was going to be ok, but deep down I knew it was not good. She was amazing really and I said we can do it and I will see your mammy tomorrow. She smiled and gave me a high five. The next day we left about 9am and sailed all the way down to Grenada. We tried with the main sail but it got jammed so we gave up and I just put the head sail up and off we went. It was amazing really and we both really enjoyed the sail down. After about 2 hours of sailing we got a call from Simon saying that Kim was going to be okay but she had to go back to the UK for more tests to find out what happened. What a relief and the look on Sienna’s face said it all. When we eventually arrived at St George’s and anchored perfectly for the first time, we both jumped into the dingy and went to see Simon. Seeing Simon again was just lovely and he embarrassed me like I was his best friend. You could see he wanted to talk but he looked shattered and was desperate for a shower, so he jumped into the dingy and went to the boat. While Simon was away myself and Sienna, stayed in the restaurant, and treated ourselves to a well deserved brownie and ice cream which was just perfect. Once Simon returned he explained that her heart was doing 233 beats a minute and did this for 2 hours, no wonder she was frightened and when I read her blog later I did not realise how bad it was. Yes I had a feeling it was bad but I tried to blank it out and stay calm for Sienna’s sake and it worked to. She is only 8 and the last thing I wanted to do was to put the fear of death into to her. Pardon the pun, but she was with me now and that was scary enough. Anyway, Kim was in good hands in the hospital and we could see her soon, so all I wanted now was for her to fly back home, get sorted and come back as my family were joining for Christmas and we were all excited to meet each other. Once Kim was discharged from hospital she came back onto the boat where she could get a good nights sleep and relax. The next day Simon said that they had to fly home on the 14th Dec to see the doctors but they weren’t sure when they could come back until they find out more information. I was so disappointed as I desperately wanted them to meet my family but her health was more important than seeing them. As we were having dinner later that evening, Kim and Simon started to chat about what was going to happen when they were away, and I was expecting them to say that they had booked the boat into the marina and it would stay there until we get back, but to my surprise they told me to take my family and the boat and go sailing. Holy Sh** I was not expecting them to say that. This is their home, their pride and joy and they were going to give it to some northern bloke who has never sailed before, they must be crackers. It has be those pills Kim is on, she can’t be saying the that surely, but she was and they both meant it too. It was at that time when my arse started to twitch and I got a cold sweat. I think I need to and have a lay down and compose myself. I looked at both of them and said, “Are you sure”. If we did not trust you then we would have it booked into a marina by now, so take your family and enjoy the trip…. If you want to read about the episode try Kim’s Blog and she will give you her side of the story. Until the next blog, thank you for reading and I do hope you are enjoying it. Thank you Sandra, but one I was excepting though.